Level-of-detail (LOD) rendering is a key optimization used by modern video game engines to achieve high-quality rendering with fast performance. These LOD systems require simplified shaders, but generating simplified shaders remains largely a manual optimization task for game developers. Prior efforts to automate this process have taken hours to generate simplified shader candidates, making them impractical for use in modern shader authoring workflows for complex scenes. We present an end-to-end system for automatically generating a LOD policy for an input shader. 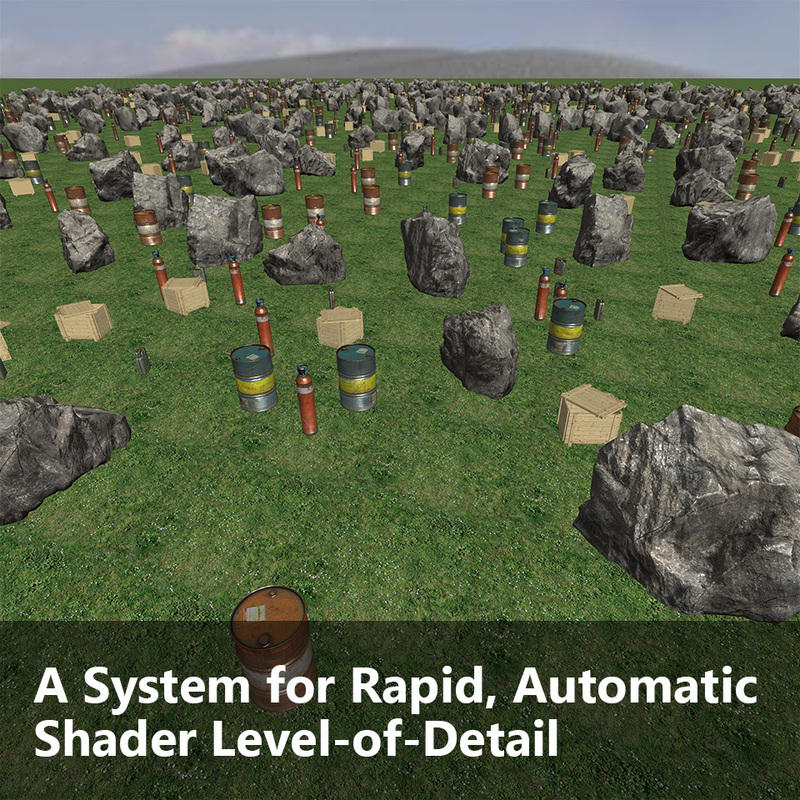 The system operates on shaders used in both forward and deferred rendering pipelines, requires no additional semantic information beyond input shader source code, and in only seconds to minutes generates LOD policies (consisting of simplified shader, the desired LOD distance set, and transition generation) with performance and quality characteristics comparable to custom hand-authored solutions. Our design contributes new shader simplification transforms such as approximate common subexpression elimination and movement of GPU logic to parameter bind-time processing on the CPU, and it uses a greedy search algorithm that employs extensive caching and upfront collection of input shader statistics to rapidly identify simplified shaders with desirable performance-quality trade-offs.